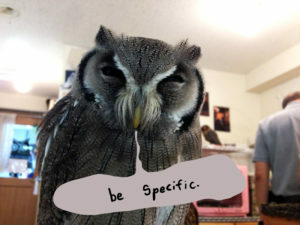 Almost any essay or application can be improved through specificity. A precise statement helps you say more in fewer words, avoid confusion, and convey the uniqueness of yourself, your subject, and your experiences. –> I studied street art in international cities. –> I studied Banksy’s and ROA’s street art in Madrid, Tokyo, and New York. –> One experience that changed my life was when I visited a small abandoned town with my best friend. –> My life changed in the summer of 2004 when I visited the small abandoned town of Horton with my best friend Sam. But you can foster the most clarity and energy from verbs. In fact, the right verb makes many adjectives and adverbs unnecessary (–> the right verb obviates many adjectives and adverbs). Your thesaurus time is best spent with verbs. Generally, you can check if a verb can be improved by asking, “How does it [verb]?” And if you can think of a verb that includes the “how” in its meaning, then it’s a stronger verb. –> The environment is related to people’s health. –> The environment influences people’s health. –> Our team did well in the HamTech Code-a-thon competition. How did your team do well? –> Our team reached the final round of the HamTech Code-a-thon competition. –> Before the TOEFL, I trained for three months. –> Before the TOEFL, I transcribed Ted Talks and practiced short responses for three months. –> My goal is to work in a major bank. –> My goal is to apply my knowledge of economic theory as a manager at a major bank. –> After the program, I spent the summer lifting weights and reading Dostoyevsky. That’s cool man, but what program are you talking about? –> After the college-prep program at Cornell, I spent the summer lifting impressive weights and rereading all of Dostoyevsky. Ah, maybe the second part sounds a little pretentious now . . . but got it! –> With my bachelor’s degree, Tres Super Poetry Award, and curation experience, I am the perfect fit for your program. Hold up, since you never specified, I’m going to take a guess here: You have a bachelor’s degree in zoology, you won an award for a poem about snails, and you led petting tours of a mollusk museum? –> With my bachelor’s in museum studies, familiarity with contemporary literature as demonstrated by my Tres Super Poetry Award, and curation experience in Smithson College’s student museum, I am the perfect fit for your contemporary art program. Well, I got the museum part right. –> China will have to spend more money and time to recover the environment. You mean, like another week and a hundred dollars? Or like several decades and an incalculable fortune? –> China will have to spend several decades and an incalculable fortune to recover the environment. That’s an improvement, but it would be even better to cite specific estimates from a study, government statement, or journal article. Examples can be added after an un-specified statement, for example, this sentence. But examples can be skillfully included inside of statements like this sentence too. Upon completion of my postgraduate program, I plan to work in a multinational enterprise to hone my talents and provide customers with optimization products and services. At first glance, this seems okay. Applicant #1 added good narrowing details about the type of business he wants to work in and what he wants to do there. But in reality, he will not stand out. This sentence may differentiate Applicant #1 from someone who does not practice logistics. However, this will not differentiate Applicant #1 from other logistics applicants. And guess whom he will be competing against when applying to a logistics graduate program? After Chesterfield’s program, I plan to work in a multinational company like Globo-Manufacturo where I will develop my ability to optimize complex international supply chains. So which applicant would you choose? Which applicant seems more knowledgeable and likely to succeed in their field? Applicant #2, please! You now have three ways to add specificity: precise words, narrow details, and examples. Use these to make your writing clearer, stronger, more succinct, and more unique. When I write my own applications and essays, my first draft is never specific enough. It’s an important part of the writing and revising process to realize points where you can add specificity and points where you can take specificity out. It’s true! Specificity doesn’t always help, particularly if being more specific means adding more words about a nonessential topic. Always use your best judgement to create the best piece of writing as a whole. Post questions in the comments and I’ll be happy to answer.